Photos by L. Browning. Clockwise: Indonesian Cultural Club, Philadelphia Argentine Tango, freestyle dancing on stage, Roberto Rodriguez-Garcia, more freestyle dancing, Kun-Yang Lin and Dancers, Anna Drozdowski. To the above artists as well as to all who contributed to making World Dance Day 2010 happen, including the Piazza at Schmidts, Lululemon, Domenick & Associates, Lois Welk, Natasha Miller, Jerome Harris, Jodi White, Carolyn Thompson, DJ Tony M, Molly Jackson, Zhu Yunlin, Alison Chaplin, Mutia Hite, Ellie Goudie-Averill, Alex Blau, Andrew Thompson, Kate Abernethy, Rajiv Shah, Gina Stickney, Eiren Shuman, Meredith Klein, Andres Amarilla, Makoto Hirano, Sara Trinidade, Sara Webster, Kira Licata, Cristin Van Horn, Amelia Longo, Katherine Paulson and our food sponsors Rustica, Darlings Diner and Kong Restaurant. They say nothing in life is free. But for World Dance Day 2010 in Philly, dance classes are free from 4-530PM and at 6pm a free show sampling the diverse dance available in the city will take the stage. All this is happening on the Piazza at Schmidts in Northern Liberties. The full evening is from 4-8PM. Again, how much for all this joy? It’s free! So come try out hip hop, yoga, argentine tango, salsa and more. Come watch some free dance, grab a snack in the neighborhood, win a prize in our raffle and dance free style with our vinyl-spinning DJ. We’ll see you there. Performers include Anna Drozdowski, Indonesian Cultural Center, Philadelphia Argentine Tango, Kun Yang Lin Dance Co & more. April 29, 2010 Philadelphia - 954 Dance Movement Collective is bringing Philadelphia's first celebration of World Dance Day to The Piazza at Schmidt's in Northern Liberties on Thursday, April 29, 2010. World Dance Day is an internationally honored festival to promote and celebrate all forms of dance. This event will be from 4:00 PM to 8:00 PM and free for all ages. The location will be North Second Street and Germantown Avenue, below Girard in Philadelphia. The rain date for this event is exactly one week later on Thursday, May 6, 2010. 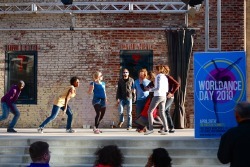 World Dance Day will start with an outdoor TEACH-IN, 4:00 PM-5:30 PM. This will be an opportunity for the community to try out dance classes of different disciplines including salsa, tap, modern, Indonesian dance, yoga, Argentine tango, hip hop, and more. All levels of movers are encouraged to dust off those winter cobwebs and dance into spring. 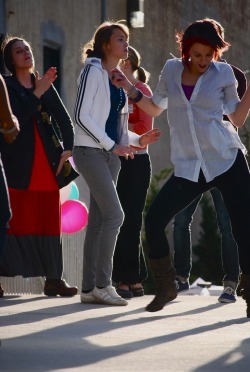 World Dance Day will continue with an array of performances from 6:00 PM -8:00 PM. These performances will showcase all walks of dance ranging from Indonesian traditional dance, Modern, Tap, Argentine Tango, etc., from Philadelphia and beyond. 954 Dance Movement Collective is a creative space offering shared resources for movement artists. Home of professional dance company, keila cordova dances and 3 Pony Show, it's a beautiful column-free 1140 sq ft windowed studio. 954 Dance Movement Collective's mission is to support the creation and enjoyment of dance in the Greater Philadelphia community.